Olympic silver medallist Emma Pooley is set to return to the British cycling team for the Rio Olympics in 2016, having retired from the sport in 2014. 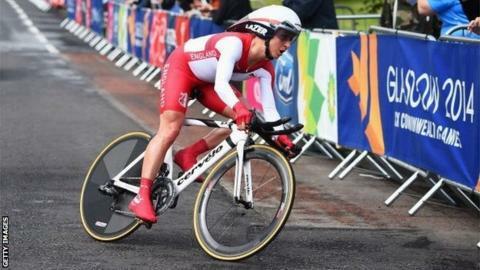 The former world champion will target the time trial and may also support Lizzie Armitstead in the road race. Pooley, 33, retired from cycling after winning two silver medals at the 2014 Commonwealth Games to concentrate on triathlon and other endurance events. "This is a truly rare opportunity that I can't resist," she said. Pooley won silver in the time trial at the 2008 Beijing Olympics before finishing sixth in the event at London 2012, where she also helped Armitstead win a silver medal in the road race. The 29.8km time trial course in Rio features the 1.2km, 7% average gradient Grumari climb and the "impressively hilly nature" of the terrain persuaded Pooley, renowned for her climbing abilities, to come out of retirement and target a gold medal. "I've decided it's worth a serious attempt at targeting that event," she said in a statement on Wednesday. "If I can prove to both myself and the GB team selectors that I have the capacity to win the time trial in Rio, I'll compete for selection for the Olympic team - I'm happy knowing I won't get selected unless I really do have the potential to win. "I have no desire to go to the Rio Games, and sacrifice some of the most exciting triathlon races of the season, just for the experience of another Olympics - I'm committed to aiming for gold." After turning to multi-sport events in August 2014, Pooley won the world long-distance duathlon title at the first attempt a month later, breaking the course record by 16 minutes. She successfully defended her crown in September and is aiming to make it three consecutive wins next year, adding that long-distance triathlon and duathlon remain her "main focus" in 2016. Yet after studying the Rio courses, British Cycling technical director Shane Sutton says he approached Pooley about a return, believing she could also improve world champion Armistead's chances of winning gold in the road race. "I'm really pleased that Emma saw the value in the opportunity and is back with us," he added. "Having her talent and experience in the team enhances our medal prospects in the time trial and Lizzie Armitstead's opportunity to win the road race. "The road race field is likely to fall away from behind, but as a pure mountain climber, I don't see Emma falling away. It would be great to see her in the road race supporting Lizzie." Meanwhile, former Tour de France champion Sir Bradley Wiggins says he wants to keep riding beyond this season, having previously claimed he would retire at the end of 2016. The four-time Olympic gold medallist, 35, is set to compete in the team pursuit on the track at Rio and could continue racing into 2017. "I will see how I feel this time next year," he said. "There might be other opportunities. If I haven't got a job by this time next year I will keep racing."